Everybody loves Italian food. Give me pasta and I am a happy girl. My husband loves pizza. Friday is Pizza night at our place. But, I make pasta too. Fixing a pasta dinner is no big deal if your pantry and refrigerator have all the ingredients. 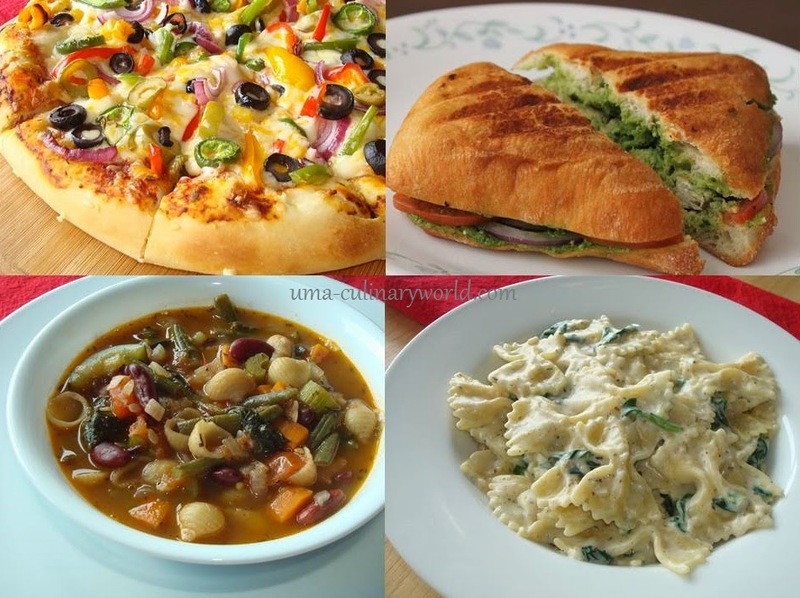 Here are our family favorite Italian recipes. Let me start with everyone's favorite Pizza. A quick sliced bread pizza too for cheese lovers. Coming to pasta, we like the white sauce for pasta. So, Bechamel sauce and Cream Cheese sauces are the easy ones for me. Also, a desi style pasta with Indian spices. Pasta salads for salad lovers too. My baby and I love Minestrone soup, not my husband's favorite. For him, I make Pesto Chicken Panini and everyone is happy. The last one is a delicious snack with veggies and cheese. Hope you like these recipes on your Italian nights. More recipes are on the way. Have a great weekend!